I am on such a creative high right now. Literally, there is nothing that can bring me down. 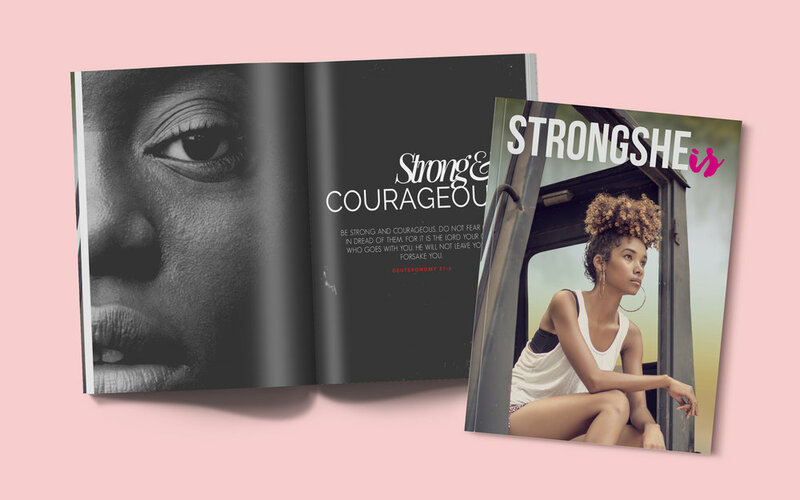 I partnered with the lovely, Jose Taylor of Windsor, North Carolina to design the first edition of her new magazine, StrongSheIs. I met Jose 3 years ago when her daughter, Jharnell, was one of my senior models. Over the course of that time, I've had the opportunity to sit with Jose to talk about our dreams and business ideas and we've truly created a connection. When she first presented the idea of starting her very own magazine, I was all GO for it. You guys know how much I love magazines, literally it's been my obsession since I was a child. She had the idea to launch the StrongSheIs magazine to chronicle the stories of women who have faced obstacles and have overcome them in hopes to inspire, motivate, uplift, and empower women from all walks of life. A domestic violence survivor, Jose realizes how important it is to be transparent in your truth to help others get through theirs. The first edition highlights Breast Cancer Awareness and Domestic Violence. StrongSheIs is an amazing platform and I'm so so so happy to be a part of this amazing magazine.
" ... grab a cup of java, cappuccino, hot chocolate, coco, apple cider, ginger ale, green tea, iced tea, or whatever fills your cup and journey with me through page after page of intriguing and invigorating insightfulness into StrongSheIs..."
Jose, thank you so much for allowing me to share in this journey with you. It's truly a blessing to be able to work with you. I believe wholeheartedly in your vision and I know this is going to impact so many women. You are phenomenal! If you'd like a copy of StrongSheIs Magazine, email Jose at candid.women.inc@gmail.com to find out more information on how to get one!